Biratnagar, March 17: Prime Minister KP Sharma Oli has said the Council of Ministers would be given full shape in right time. Talking briefly to media persons at Biratnagar airport today, PM Oli made it clear that Cabinet was not being reshuffled but getting full shape. Also the Chairperson of Nepal Communist Party, PM Oli argued that Biplab-led group was indulging in murder, violence, loot, vandalism, so its activities were curbed. As the Biplav group is a mere cluster which is nowhere registered but conducting illegal activities, it was prevented to do so anymore, he said, making it clear that only any organization registered at any government office is banned. "Government does not banter. 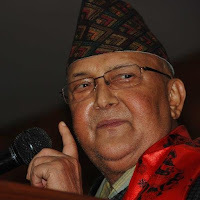 It not only rules out but also controls any group spreading panic among public with murder, violence and terror," PM Oli said to a clear indication to Biplab-led group. He wondered why leaders of Nepal's democratic parties were making hue and cry over while ruling out the Biplab group. It is not wise to respond everything, he commented. The PM further asserted that not any of Biplab's demand could suit democratic society. Moreover, the PM asserted that the forces advocating for separatism and disintegration was now no more in Nepal. He urged one and all to know why some leaders were making fuss again when CK Raut opted for active politics by accepting the constitution.